Tell me, what do you consider the best spec right now? Is it Rattleclaw Mystic? After all, the little thing could go nuts if Birds of Paradise isn’t reprinted. Is it Abrupt Decay? It’s safe from Modern Masters 2015 and could easily go to $20 by this time next summer thanks to incoming product. What about Flooded Strand or Polluted Delta? Both are great fetch lands, and will be around forever. Staying with Khans of Tarkir, what about Siege Rhino? Surely it’s bottomed. All of those are good answers, and all of those are varying degrees of good specs. But they’re not the answer I came up with. My money is on Phenax, God of Deception. 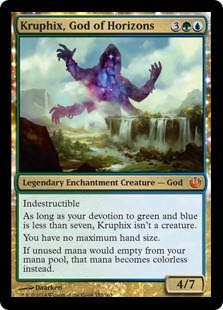 Or Kruphix, God of Horizons. In a Magic world full of Spikes, it’s Johnny that holds my heart. The mythical kitchen table. The place where epic battles are fought and technically terrible games of Magic are played. The place where no one cares about the latest tournament results or that Ulamog costs a million mana, because they will cast him, darn it. If you’re reading this, chances are you’re on the spikier side. By that, I mean you’ve played Friday Night Magic. You may have even played in a larger tournament, or at least watched the coverage of one. You know the value of your cards and you keep them carefully sleeved. But the truth is, we are the minority. The majority of players who spend money on this game are more interested in the cards their buddy is playing against them at home than they are in what LSV is sleeving up at the latest major event. People come into my store all the time who have never played outside of their homes. They have no interest in showing up to a tournament—all they want to do is crush their friend’s angel deck at home. But don’t make the mistake of equating “casual” with “cheap,” because that’s just not the case. In fact, I sell more cards to these “casuals” than I ever do to tournament players. It’s no surprise, then, that I say I love casual Magic. And so should you. Before we any further, what exactly defines a “casual” card? There is no hard-and-fast answer to this question, to be honest. A lot of times people conflate “Commander card” with “casual card.” And while the reality is very different and so are the market ramifications, the truth is they behave similarly pricewise. They’re dirt-cheap when they’re in Standard and typically grow from there, following the opposite path of most newly printed cards. So while I’m not calling them the same thing in theory, the truth is there’s not much difference in reality, at least when it comes to our strategy on them. That said, I’ll let Jason’s series fill you in on the Commander targets, and I’ll take care of the casuals. Keep in mind everything can be a “casual” card, from the gods I mentioned earlier (I like all of these in the long-term, but especially the two I mentioned since they’re from small sets and are cheap right now) to the random lifegain cards that pop up from time to time. But I’ve done what I can do present at least some general guidelines. Archive Trap is nearly $5 and still rising, while Glimpse the Unthinkable is the poster child here at $25. Hell, even Memory Sluice, a random trash common, is 50 cents. These cards are played in zero competitive decks, but still hold their value. The reason? People love their mill, man. It’s a terrible strategy, but it never goes away. I (gently) tried to explain to a player at FNM last week who tried to convince me that playing one copy of Mind Sculpt in his Magic 2015 flashback Sealed deck was a good idea because, hey, you could mill their good cards! It doesn’t make sense, but whatever. Just roll with it, and grab those Increasing Confusions as throw-ins or out of bulk piles while you still can. The card has languished for the last two years but has shown a little growth this year, and history tells us it will be $4 to $5 eventually. Obviously you’re looking at a long-term mover here, but it costs you nothing to hoard some of these and forget about them in the spec box. Without a doubt, these are the two biggest tribes when it comes to casual players. I’ve had people come in and literally say, “I want to buy every angel you have.” In fact, his buddy was with him and then said, “I want all your dragons.” If I didn’t see these two guys with my own eyes, I would never have believed this type of person existed. But we need look no further than Dragons of Tarkir to the proof of this. Dragons from all over have gone crazy this year, from Scion of the Ur-Dragon to seemingly-random stuff like Utvara Hellkite and Scourge of Valkas. If it’s a dragon, it rose in price this year, and that’s not an accident, nor is it a coincidence that Wizards always includes one or two of these in each set. There’s a big dropoff after that, but vampires and hydras have also done well historically. 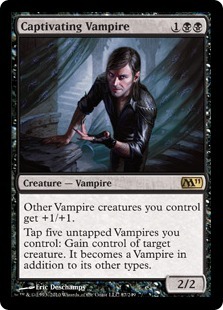 Captivating Vampire is $7 despite being in an Intro Deck. There’s one other tribe I have to mention: the little green men. It’s not at all surprising that Wizards stuffed the mono-green Commander deck last year full of elves like Immaculate Magistrate and Imperious Perfect. Even the thrice-printed Elvish Promenade is worth a few bucks. People like their elves. As much as I wish I was talking about Lord of Atlantis, I’m only doing so in the general sense. People like to build linear decks at the kitchen table, and often that means tribal. I’m no different: I have a sweet Tribal Treefolk deck that I bust out for 60-card casual rarely, and I love my $4 Dauntless Dourbarks and $8 Timber Protectors. The reason cards like Timber Protector and Elvish Champion ($4 despite numerous printings) and the aforementioned Captivating Vampire speak to this phenomenon. I’m not saying stock up on Rageblood Shaman (remember when people thought this was a good idea? Ew), but I am saying that stuff like Sliver Hivelord and Sliver Hive are good bets to steadily rise long-term. And I’m absolutely in love with Haven of the Spirit Dragon once it settles down a bit in Standard and falls to $2 or so. I’ve named a lot of good casual specs so far in this article, but the more important question is… why? 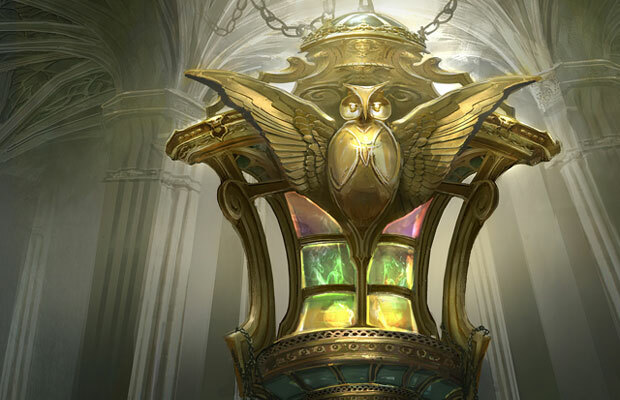 What makes them better than speculating on a Standard or Modern card? After all, when those go, they tend to go big. Like I said before, these are almost always cheap at some point. They offer a super low buy-in point, and as such if they go nowhere or are reprinted into oblivion, you’re not losing much. On the other hand, they typically represent very steady gains every year. I know people refer to original duals as the “blue chip stocks” of Magic, but solid casual specs fill that role just as well while also having the advantage of starting out as penny stocks. Casual cards aren’t subject to the whims of the tournament crowd. We’ve all made lots of solid spec calls on competitive cards that never panned out for whatever reason (yes, this is where you remind me of my 94 Splinterfrights). Rattleclaw Mystic, for instance, could be a great spec heading into rotation. On the other hand, if Birds of Paradise is reprinted in Magic: Origins, then the Mystic isn’t going anywhere. Casual cards don’t behave like that. Haven of the Spirit Dragon isn’t going to be made obsolete any time soon. And even if something similar and maybe better did come along, people are likely just to play both. After all, they can play as many cards as they want in their decks, so why stop at 60 if you have more sweet cards? As I spoke to above, these cards are not hard to find. Tournament players literally give away these cards or leave them on draft tables. If you want to be the guy grabbing all the Increasing Confusions at your store, no one is going to stop you. You can get these as throw-ins all day long, and no one will care. And this even works with the obvious ones. I was all over Chromatic Lantern the minute it was printed, and despite it being such an obvious call at $2 people still threw these at me all day long. As we know, Lantern is at an all-time high of nearly $7 and is showing no signs of slowing. And I have a giant stack of these acquired solely through trades. This is not a humble brag: it’s proof of concept. Even when these things seem “obvious” to those of who care about finance, the truth is most players just don’t care. This may be a bit more anecdotal, but some of my best experiences buylisting cards comes when those cards are casual ones. Outside of the flavor-of-the-week Standard card, dealers usually have plenty of stock of something. They don’t need another Siege Rhino from you right now, no matter how busted the card is. But they may need those Timber Protectors or Chromatic Lanterns. After all, the most common way for dealers to buy cards is from players at tournaments, which by default usually means tournament players. Those same players who threw all the Lanterns at me years ago and who don’t have any now. To get the cards the casual players want to buy from them, stores often pay more on casual staples than they do random competitive cards. This is my experience and is not based on any empirical data, but it’s also how I operate when I buy cards. I have much more confidence in paying a good price for an Asceticism ($7 retail) than I do for a $7 Standard card that may or may not sell and may or may not stay $7 for long. I love casual Magic. You should, too. And before I go, I have a few casual cards I haven’t yet called attention to. Nicol Bolas, Planeswalker is on a tear, and is almost $9. Again, we have what was a $20 card before a reprint. This has seen a lot of growth already this year so it’s not quite as attractive, but this is going to continue to climb. Door of Destinies is at an all-time high of $3.50, and this will continue to climb back toward the $8 it was before the reprint. Rise of the Dark Realms sits at $4.50 after some momentum, and as a mythic this one should rise at a faster clip than the others. Gilded Lotus is also at an all-time high of $6.50 (noticing a theme of “casual reprints in core sets?”) and will be $10 within in a year. That’s a lot of picks, and truth be told I could go on. But then again, I love casual Magic. I’m with this guy….can’t access forums, can’t read all pro trader posts….why did I pay for this again? If you can’t get into the forums, please email webmaster@mtgprice.com and we’ll get it fixed. As for this specific article – looking at it now. Will fix. I have updated the article – should work now. Please comment if it doesn’t. So, this site is going greedy like QuietSpec now. You dont really think your articles are worth a paid subscription? Agree, I also can’t see this article. Thoughts on foil casual cards? I’ve noticed that unless there is an overlap for Commander the foil price multiplier is quite low. For example, the foil price of Timber Protector is $10 which is a 1.2 multiplier. The big difference between kitchen table and EDH is kitchen table doesn’t affect foils. They don’t care about pimping out decks, just playing them. At least, that’s what the finances have always told us. Your article’s intro spoke to me directly, but perhaps in a different way. I’m one of those casual kitchen table players who loves the game but has little, if any, interest in tournament play. Crushing my” friend’s angel deck at home” is precisely my motivator, and I’ve found the game to be much more financially stable due to a lack of the frequent ups and downs that accompany spiking card values after tournaments. In fact, keeping abreast of tournament play allows for profiting off tournament-related spikes to fund my casual play. You mentioned tribal cards, and some of the most sought-after in my circle tend to be those that boost their tribes in some capacity. The uniqueness of a card matters. If there are cards similar in function, it loses some of its appeal. Thus, cards like Omniscience have big appeal, because there’s little out there that fills the same role. Cards that help combat my friend’s “annoying and broken” combo have a lot of appeal. If I can mess up his plans for some cooked-up combo and wipe that smirk off his face, I feel like I’ve already won—despite the end results. Arguably, planeswalkers are about as high up there as dragons and angels, when it comes to casuals. Tibalt has a committed—albeit small—fan base out there. Sometimes, planeswalker appeal is due to power level, sometimes pure storyboard, and sometimes just because casuals don’t always have efficient removal in mind when creating their decks. Either way, these very much go hand-in-hand with my earlier comment on a card’s uniqueness. I’ll point out an observation from my playgroup (about 15 total, though rarely have we ever had more than half show at once). We tend to be Timmy and Johnny players. There are few Spikes among us. In fact, the only Spike that we’ve had stopped coming, preferring to instead go to FNM. Screw him. 😉 That said, cards that appeal to those kinds of players are—surprise!—popular in our group. Big hydras with exponential counter growth? Check! Ensnaring Bridge and Sire of Insanity? Check! Of course, not all of these things will translate into favorable pricing, but I think combinations will. Anyhow, I wanted to throw in my two cents for those who will be interested in an anecdotal case study. P.S. One commentator asked about foils. While most of my playgroup couldn’t care less about foils, I and a few others are vehemently passionate about them. I’ve found the lack of casual demand for foils is a misnomer when pertaining to cards destined for cubes or commander. Because foils are superior in holding value and standing against the ebbs and flows of price fluctuation, I almost exclusively buy foils versus regular cards. dude none of my email addresses are working since this site went to pay. i cannot fully view ANY protrader content and its starting to piss me off because i’m BEING BILLED TWICE AT THIS TIME. I apologize for any problems you’re encountering, It’s certainly not our intent. If you shoot an e-mail to webmaster@mtgprice.com we’ll get things taken care of as quickly as possible. I really don’t understand why this site has gone from having articles I enjoyed reading to having to pay to see these articles with almost no content without paid subscription. I agree with the comment above “have fun sinking this ship”. I will no longer visit your site and will tell my friends to do the same. Thanks for ruining a good thing. I’m sorry you feel that way. We plan to always offer free content so people will always have a reason to visit our site if they are interested. We certainly understand it’s not for everyone, and I hope you’ll understand that we believe our authors provide valuable information worth subscribing for. This report I found in particular to be pretty informative with good reasoning behind the specs. Can people give productive arguments to why this content is garbage before panning it? Casual magic defies most logic so their specs can’t be approached in standard ways. These are always so low risk that if you have 1 hit out of 5, you are likely to make gains just as good as an expensive standard spec with much less risk. Holding onto casual cards also gives you good trade value to casual players who care not for value and will trade shocklands all day for valueless cards you have to learn to identify. I appreciate the kind words. There are always going to be detractors no matter what you do, and I’ve had to deal with it for a long time now. I do what I can to listen and adapt where need be, but I’ve accepted that I can’t please everyone no matter how much I might want to. This really got me to thinking differently about tribal cards as pick-ups. I’m already 35 deep on promo Dragonlord’s Servant. I didn’t want to miss the next Dragonspeaker Shaman. Great article, I’m glad I’m a lifetime member now. It is very difficult to determine if I want to subscribe based on the very small selection provided in the ProTrader articles. It may be beneficial to increase the size of the unblocked portion of the article for people who may be unfamiliar with the authors and with the potential that could be unlocked.